The following bulletin was obtained from the public website of a private security company. 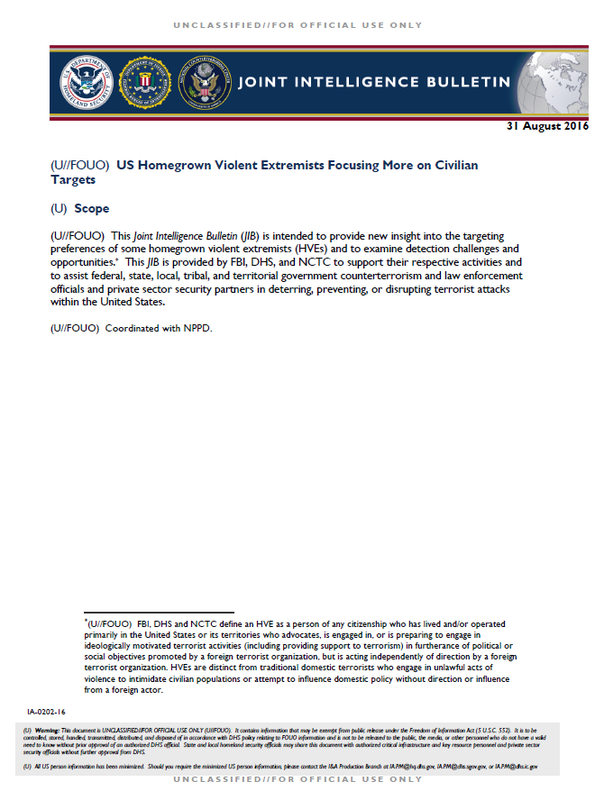 (U//FOUO) This Joint Intelligence Bulletin (JIB) is intended to provide new insight into the targeting preferences of some homegrown violent extremists (HVEs) and to examine detection challenges and opportunities. This JIB is provided by FBI, DHS, and NCTC to support their respective activities and to assist federal, state, local, tribal, and territorial government counterterrorism and law enforcement officials and private sector security partners in deterring, preventing, or disrupting terrorist attacks within the United States. (U//FOUO) We assess that HVEs are increasingly favoring civilian targets, judging from our review of HVE targeting activity since January 2015, when the first ISIL-inspired HVE plot occurred after ISIL began publicly calling for attacks in the West. This alters our previous assessment that most HVEs probably would prioritize law enforcement personnel, military members, and US Government-associated targets. While HVE activity over the past twelve months particularly has demonstrated a shift towards civilian targets, we note that HVE radicalization and attack planning are unique to each individual, and assess that some probably will continue targeting military and law enforcement personnel. » (U//FOUO) Seventy-seven percent of the thirteen HVE attacks and disruptions during the past twelve months focused on civilian targets, in contrast to eleven percent of the eighteen HVE attacks and disruptions in the first seven months of 2015, according to our review. » (U//FOUO) Three HVE plots in 2016 targeted houses of worship, the first such cases since a 2009 plot against a New York-based synagogue, according to our review. In addition, since the beginning of 2015, HVEs have plotted against or attacked restaurants, a nightclub, a concert, a public ceremony, a place of employment, and a college classroom, demonstrating the variety of targeting choices. (U//FOUO) HVEs likely focus on civilian targets because of a combination of factors, to include perceived lower levels of security at civilian targets, a desire to select familiar targets of personal significance to simplify plotting, direct encouragement from overseas violent extremists, and violent extremist messaging glorifying recent attacks on civilians. » (U) In December 2015, a Michigan-based HVE told an FBI undercover employee that he was planning to attack a local church on behalf of ISIL because it would be crowded and would be an easy target, as worshipers are not allowed to carry guns, and he believed that the attack would receive extensive media attention, according to court documents. » (U) In November 2015, a now-deceased HVE in California—who had viewed pro-ISIL messaging in the weeks prior—stabbed a classmate and three other individuals at his college, according to press reports. After the attack, local authorities found a note on the HVE citing his anger at being kicked out of a study group, according to US media reports. » (U) In December 2015, a New York-based HVE plotted to attack a local restaurant and bar and take hostages because an overseas ISIL member told him to attack nonbelievers at a crowded location on New Year’s Eve, according to court documents. (U//FOUO) In May 2016, ISIL spokesman Abu Muhammad al-Adnani publicly stated that ISIL supporters should target civilians in the West because of difficulties attacking military targets and retaliate for the anti-ISIL bombing. ISIL media offices also released numerous videos praising the Paris, Brussels, and Orlando attacks and encouraging similar operations in the West. (U//FOUO) HVEs probably will continue to focus on civilian targets because of the combination of factors that make such targets attractive. We urge state and local authorities, as well as private sector security partners, to report suspicious activities related to potential mobilization to violence in the Homeland by US-based individuals inspired by foreign terrorist organizations. Many smaller public safety agencies still may not belong to a formal suspicious activity reporting mechanism within their state intelligence systems, however, this reporting gap may be mitigated.